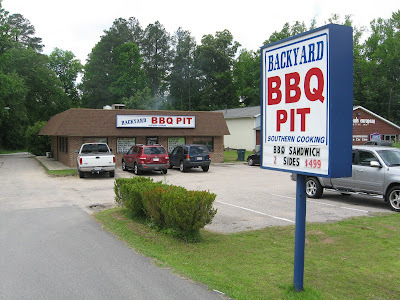 My son and I took a road trip and stopped at the Backyard BBQ Pit in Durham, NC. It's right off I 40 at 5204 Highway 55. 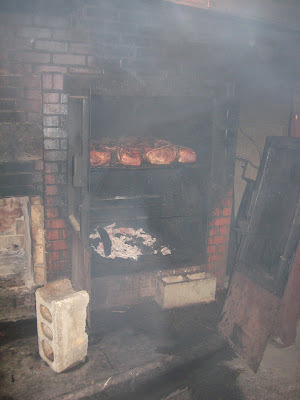 This is a real North Carolina wood burning barbecue joint, and they also smoke ribs and chicken. Side dishes are like Grandma used to make. The food was amazing, and they had a special for a barbecue sandwich and two sides for $4.99. Can't beat that. 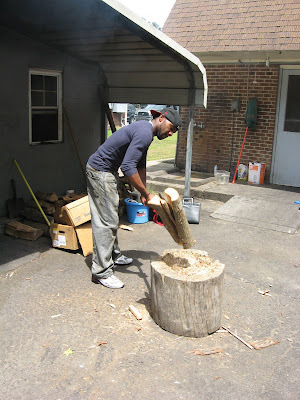 For more about Backyard BBQ Pit, check out my BBP story at Yes You Can Grill. Directions: If you're driving from Chapel Hill toward Durham, take exit 278 and turn right. Go three stop lights - just past the Golden Corral. Backyard BBQ Pit is beisde the Aamco and the ABC store. It's on the right hand side of the road. Yeah. I would agree on that, although comments are not the place for ads. I can't tell who posted this as the profile is hidden. If it's the owner or family, I'd rather you just say if you are from the restaurant. A fan? Well, step up. I just went in as a regular customer, and I loved the food. I keep it real. I ask that those visiting do as well. Yes. They really are Southern nice at Backyard BBQ Pit. We always feel welcome even when they have a crowd. They make the extra time to make you glad you stopped by. I want to try the fried fish some time. I'm a barbecue freak, but that fish looks great too. A big guy eating there told me that it was the best around. He looked like he knew what he was talking about. Hi Cyndi,today I ate at the BBQ pit and at first i was a little scared upon pulling up in the parking lot. I was visiting the area for a training and it was recommended by some co workers I ordered the 4.99 special and actually enjoyed it. (I am a NYorker and have only eaten this type of BBQ twice and I really enjoyed it). I now live in High point NC and am having a gathering for my husband Saturday and tomorrow I am calling to see if a can get half a tray for Saturday with the BBQ Sauce. my mother always said never judge a book by its cover,and I almost slept on this hidden secret..well hidden from me. Loved it! Loved it! What I thought was great was that the young man behind the counter could tell I was new to this BBQ and he joked by stating NYorkers consider chicken and ribs as BBQ, he then went on to make a recommendation..all I can say is hmm, hmm good! Tawana from High Point NC by way of NY City! Thanks for the note Tawana. I'm glad you gave Backyard BBQ Pit a try and that you loved it like I do. When I'm up that way, that's my son's favorite place to go. The food is also fabulous, and the family members working there are always so friendly. I've never been disappointed even one time.